The year is 1791. On a crisp autumn morning in South London, Margaret Hastwell, a blackmith’s apprentice, gives birth to her third son. With her husband, son, and daughter crowded around, she decides to name the newborn Michael. Michael Faraday. Margaret had a lot on her plate, what with two young children, a husband who was often sick, and quite a few bills to pay. She probably didn’t have much time or energy for idle thought or daydreaming. I doubt if she much considered what Michael might do with his life other than get by. There is no way it occurred to her that Michael would grow up to revolutionize the world of physics, make electricity a viable source of mechanical energy, and inspire countless scientists, engineers, and young people (including but not limited to Einstein, Rutherford, and this young science communicator, 223 years later). But that is exactly what he would do. Faraday went to elementary school and learned to read and write, but by the time he turned 13, he had to start work in order to help his parents make ends meet. He was apprenticed to a local bookbinder and spent the next 7 years diligently mending books. But that wasn’t all he was doing. He was also reading. Over those 7 years, Faraday read voraciously and became interested in science, particularly the topics of Chemistry and Electricity. Luckily for him, George Riebau, the bookbinder to whom he was apprenticed, took an interest in young Faraday’s education and bought him tickets to lectures by Humphry Davy at the Royal Institution in 1812. This was only shortly after Davy had discovered calcium and chlorine through electrolysis. 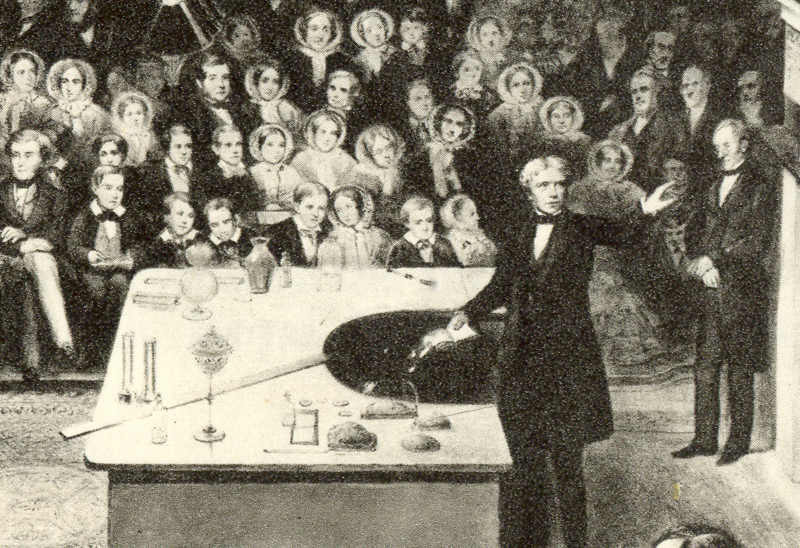 Davy was a big name in science at the time, comparable to today’s Stephen Hawking, Neil Degrasse-Tyson, or Jane Gooddall, so it was with wide eyes that young Faraday attended. He was so blown away by what he saw and heard that he faithfully wrote notes and drew diagrams. These meticulous notes would prove to be his ticket into Davy’s lab. Later that year, Faraday sent a letter to Davy asking for a job and attached a few of his notes. Davy was impressed and so interviewed young Faraday, but ultimately rejected the eager young fellow, saying “Science [is] a harsh mistress, and in a pecuniary point of view but poorly rewarding those who devote themselves to her service.” Translation: “Sorry, I don’t have space for you in my lab, but just to let you know… Science really isn’t very profitable.” A few months later, one of Davy’s assistants got in a fight and was fired, so guess who got a call? That’s right, Mikey F.
Not only did Faraday get a spot in Davy’s lab, but he also got to go on a European tour with Mr. and Mrs. Davy. Pretty sweet deal, right? On the eighteen month journey, Faraday got to meet the likes of Ampère and Volta. If those names are ringing distant bells, it should be no surprise. Those eminent continental scientists give their names to standard units of electrical current (Ampere) and potential difference (Volt). 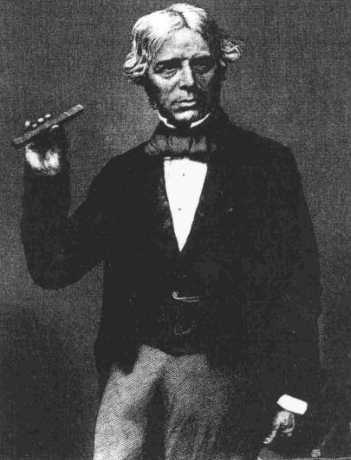 Re-invigorated, 22-year-old Faraday returned to London and took up a post at the Royal Institution as Davy’s assistant. 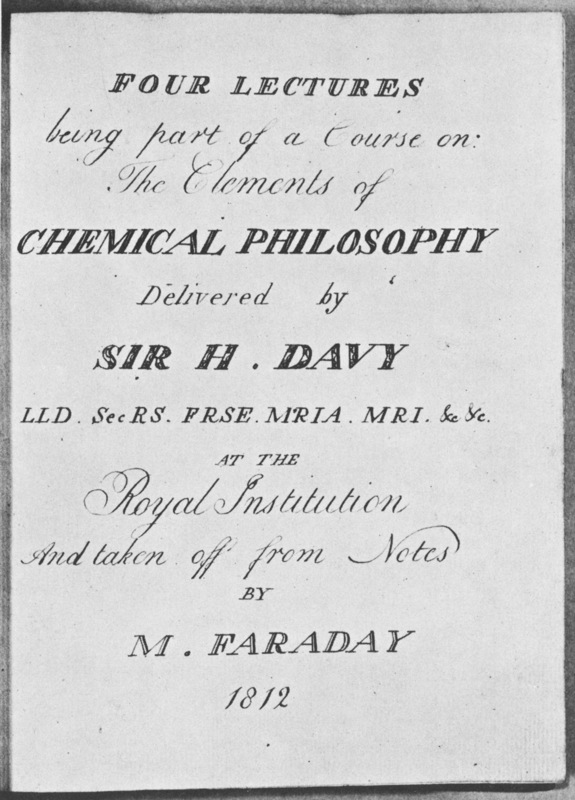 The next two decades saw Faraday make great advances in chemistry, including discovering benzene, liquefying gases, and exploring the properties of chlorine. He didn’t get much chance to focus on electricity, however, until 1821. 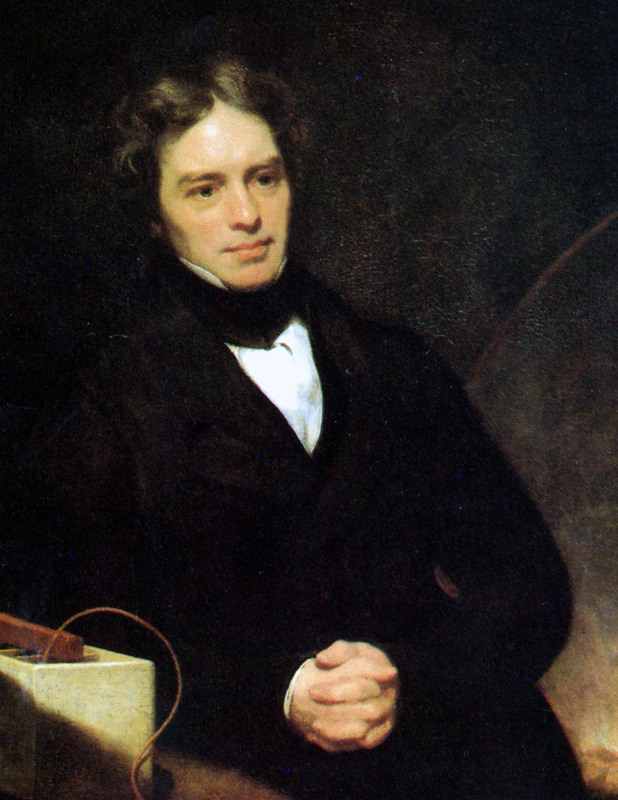 In that year, Faraday started experimenting with chemical batteries, copper wire, and magnets. Building on the work of Hans Christian Ørsted, Faraday’s work was some of the first to show that light, electricity, and magnetism are all inextricably linked (we now know that they are all manifestations of the electromagnetic force). He was a dedicated experimentalist and between 1821 and 1831, he effectively invented the first electric motor and, later, the first electric generator. These two inventions form the basis for much of today’s modern power system. The electric motor that opens your garage door as well as wind and hydro-electric generators work on the exact same principle that was discovered by Faraday back in 1831: electromagnetic induction. Faraday’s insight was that when connected by conductive material, an electric current could make a magnet move. He also found that the reverse was true: a moving magnet can create a flow of electrons: an electric current. The experiment is actually quite simple and you can even try it at home. Induction enables the transformation of energy between mechanical, electrical, and magnetic states. Before Faraday, electricity was seen simply as a novelty. Since Faraday, we’ve been able to use it for all sorts of things. Like writing science blogs! Faraday continued his work on electricity and gained all sorts of recognition, including medals, honorary degrees, and prestigious positions. This increased pressure may have been to blame for a nervous breakdown in 1839. He took a few years off, but by 1845 he was back at it, trying to bend light with strong magnets. He discovered little else after the 1850s, but continued to lecture and participate in the scientific community. So not only can Faraday be considered to be one of the fathers of the modern world because of his breakthroughs in electricity, but he can also be considered to be one of the fathers of modern popular science communication. In 1825, he decided to give a series of Christmas lectures at the Royal Institution, specifically aimed at children and non-specialists. He gave these lectures every year until his death in 1867 and was renowned as a charismatic, engaging speaker. He tried to explain the science behind everyday phenomena and in 1860 gave a famous lecture on the candle, something which everyone had used but which few actually understood. The Christmas lectures continue to this day and, continuing with Faraday’s legacy, the Royal Institution is one of the UK’s leading science communication organizations. It’s no wonder that Einstein had a picture of him up in his office. I think I might just print one off myself.